Homeschool science is so much fun. This week we made two very different fizzy fountains. On Monday we let off a diet coke and mentos geyser, and on Friday we created our own “lava lamp”. 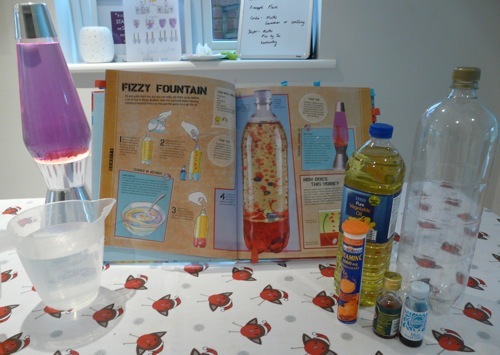 I bought the supplies for this back in June 2012, when we were doing our rocket project, but the instructions for making a diet coke and mentos rocket were evidently too daunting for me to get around to doing it. So when the children recently asked if we could make a diet coke fountain, I was all ready to go. The experiment couldn’t be simpler to explain. 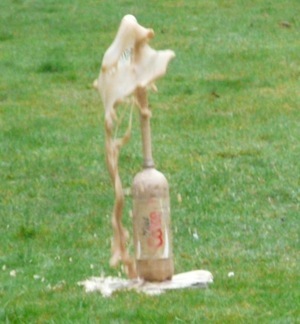 Dump a whole packet of Mentos into a bottle of soda, then stand well back. The tricky bit is trying to get all the Mentos in at once. Cordie and Jasper experimented with various techniques using an empty bottle. What seemed to work best was loading the Mentos into a piece of paper which had been rolled into a loose cone, while holding a piece of card at the thin end of the cone to keep the Mentos from falling through. The card can then be slid away when you’re ready to set off the geyser. Our Mentos-loading technique worked perfectly the first time. However, our geyser was only about a foot high. Maybe because the diet coke I’d bought for our rocket experiments was four months past its use-by date?! But …we still had a tube of mentos left, so we tried again, this time with a bottle of caffeine-free diet coke I’d been saving to enjoy with a shot of rum at the weekend (I am so selfless in the cause of science). Unfortunately this time our Mentos-loading technique didn’t work so well. No quick-fire round of mints exploding the surface tension of the coke – instead, the last 8 were hastily shoved in one by one before I scarpered to a safe distance. The resulting geyser was double the height of our first attempt, but there was no danger of getting our hair wet, let alone the roof. (I felt a bit wistful as I removed my sou’ wester hat.) But the kids – who hadn’t known what to expect – were impressed. No-one knows for sure! The most popular theory is that the Mentos break the surface tension of the soda, releasing loads of carbon dioxide bubbles at once. These bubbles push all of the liquid out of the bottle in a fantastic explosion. Steve Spangler Science has a more detailed explanation and some cool videos. We will spray our trees with coke yet! 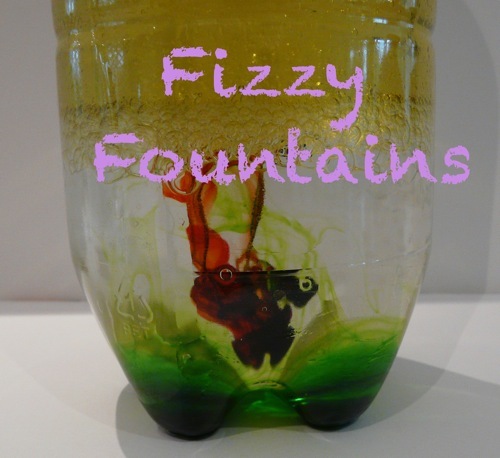 We found this in Science Experiments: Loads of Explosively Fun Experiments You Can Do. 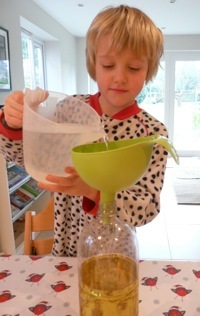 Fill a plastic bottle three quarters full with vegetable oil. Break two effervescent tablets in half and drop them into the bottle. When the tablets dissolve in the water, they give off carbon dioxide. Bubbles of this gas float up through the bottle. When the bubbles attach themselves to blobs of water, the blobs and the bubbles together are less dense than the oil, so they rise up to the surface. There the bubbles pop, and the blobs of water sink back down through the water again. use less food colouring. We used red, blue and green which together turned the water dark brown. We hunted out Big J’s lava lamp and enjoyed watching the pretty patterns as warmed wax floated up to the top and then sank again as it cooled. Next week we’re going to investigate polymers, making slime and plastic. Sounds fun! I just love those lava lamps. I’m not terribly good at doing lots of exciting experiments with my guys, which is a shame because at least one shows real interests in that area – oh, well, you can’t do it all!! Indeed we can’t … though you come closer than most!